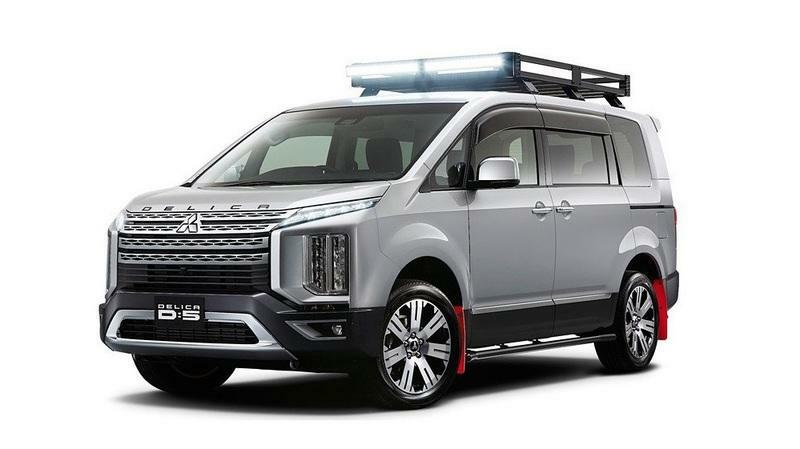 The Delica D:5 Off-Road Concept is probably the weirdest concept that we’ll see that the 2019 Tokyo Auto Salon. The standard D:5 is already weird enough with is DNA being primarily mixed with that of an SUV and a small conversion van from the 1990s. 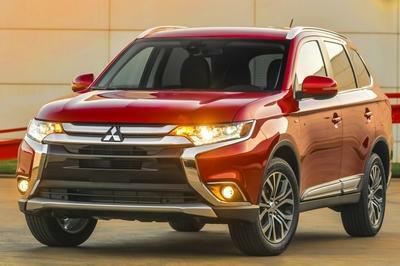 It does, however, have some of Mitsubishi’s standard DNA in its nose and the oddly shaped, recessed lights that flake the grille on either side. 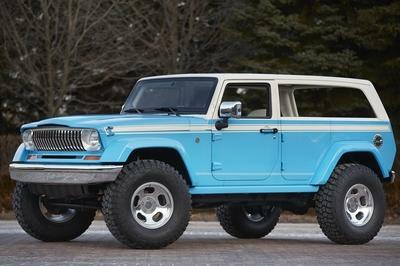 Outside of it’s weird, boxy design, it features a plethora of plastic trim meant to protect the body, side steps for easier entry, raised suspension, and a mammoth luggage rack up top that would probably be perfect for carrying all your off-road gear, including a tent, sleeping bags, and other survival necessities. It does have some rather ugly window shades, but we can get past that. What really throws us off is the lack of real off-road tires. What was Mitsubishi thinking here? 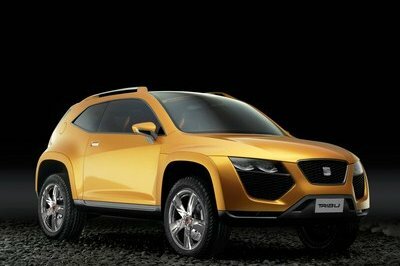 It seems like off-road tires on a concept like this would be common sense, but I guess not. Finally, red mud flaps ad a bit of color to the black and grey exterior profile while a big LED lightbar on the aforementioned luggage rack should provide some extra visibility at night. As for the interior, we have nothing to go by. Mitsubishi has only released one image and has said next to nothing about the concept. We suspect that the interior will probably be carried over from the standard model, but Mitsubishi may surprise us by offering up some more ruggedized gear inside too. That would make sense, but then again, we are looking at an off-road concept with street tires, so who knows what the cabin really offers. 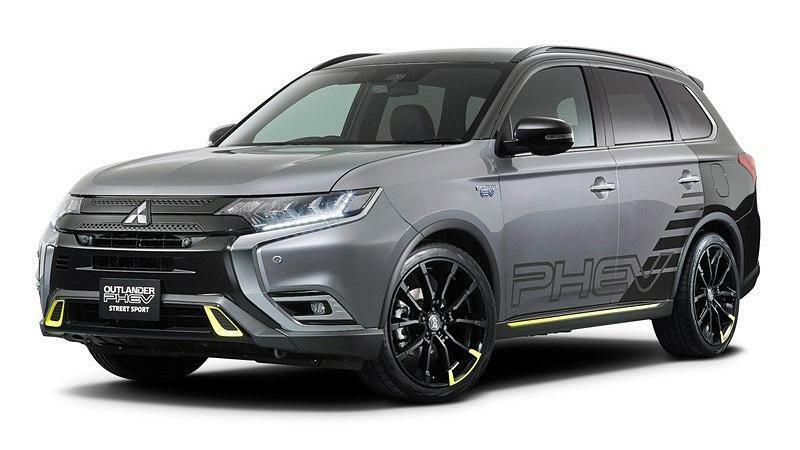 We’ve already seen the latest design of the Mitsubishi Outlander PHEV as it was just updated for the 2019 model year. 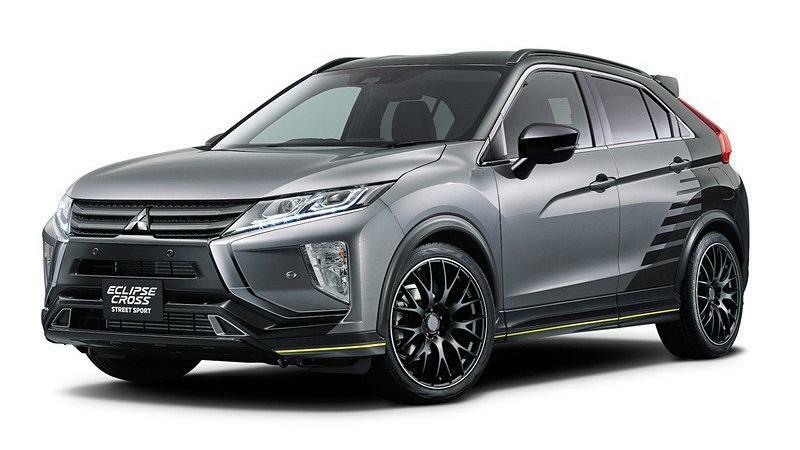 And, I hate to say it, boys and girls, but this concept is most likely just an aesthetic package that’s good for nothing more than making the Outlander PHEV look faster and more potent than it really is. Highlights include the graphics wrap on the rear that blends together the grey front end with the black rear end and roof. There is some plastic cladding on the front and sides, and the mirrors are finished in a gloss black. 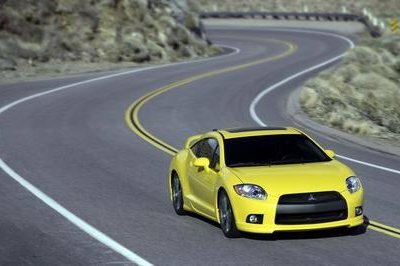 Fortunately, Mitsubishi didn’t go overboard with color accents, as there are just a few hints of yellow up front, a nice little stripe along the side step, and an extra splash of color on the wheels. If you asked, I’d tell you that the real highlight of this concept is the black wheels and blacked out nose, but that’s just me. Don’t expect any interior updates or anything in terms of powertrain updates, either. For what it’s worth, the updated Outlander PHEV comes with a new 2.4-liter four-cylinder that runs on the Atkinson combustion cycle and a slightly larger 13.8-kWh battery pack. The hybrid motors hidden under the skin are 10-percent larger than that of the previous model, and all-wheel drive is standard equipment on all PHEV models. There are no definite specs to go by in terms of horsepower and torque, but we do know that the new battery and motor combination should push all-electric range beyond the previous 22-mile mark. The batteries should be able to take a full charge in four to eight hours depending on the socket, and a slight update in power output is expected as well. Either way, however, the “Street Sport” probably won’t make a lot of sense on this concept. Mitsubishi has taken a lot of heat for using the Eclipse name – even with the “Cross” nomenclature next to it – on a crossover. 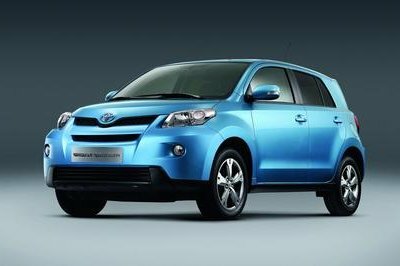 A lot of people believe that Mitsubishi is ruining a once iconic name in an attempt to build sales of the clout of the name alone. I actually thought that the use of the name on this crossover would eventually grow on me, but it hasn’t. Not one bit if I’m being honest. Be that as it may, Mitsubishi is all in now, and to generate more interest, it has applied the same “Street Sport” styling to its latest crossover. It has the same body graphics as the Outlander PHEV Street Sport, the same blacked out nose, and black mirrors. The Yellow accenting is even more subdued though, and one could argue that it’s actually a nice addition here. We can’t see the back so we can’t say for sure, but it appears as if the only yellow accenting is found on the front bumper flics, the side skirts and around the outer edge of those fairly attractive wheels. It’s hard not to let the bad generally bad opinion about the name itself cloud our vision of this concept. The truth is that the Eclipse Cross actually looks kind of cool with the Street Sport Styling. Of course, don’t expect anything else outside of exterior appearance. The interior, which is decent for Mitsubishi, will carry over untouched as will the drivetrain. That latter part of that previous statement is actually a sad one. The Eclipse Cross looks sporty; we’ll give it that. Even more so in the Street Sport guise seen here. Be that as it may, Mitsubishi is said to only offering with two engine choices. The first, which is tailored primarily toward the U.S. market, is a 1.5-liter, turbocharged, four-banger that’s good for just 152 horsepower and 184 pound-feet of torque. To make matters worse, there’s no DCT or manual transmission choice either, leaving you to go with nothing more than the standard offering of an “eight-speed” CVT. That is, of course, laughable, as we all know that CVT transmissions don’t have gears – they are constantly variable, so these gear ratios are simulated. Long story short, Mitsubishi was too cheap to design a different transmission for this model, so it decided to take its current CVT offering and use software to simulate gears. Fancy…not. The second engine offering is a diesel engine that will offer the same general output and performance, albeit it with a little more torque. 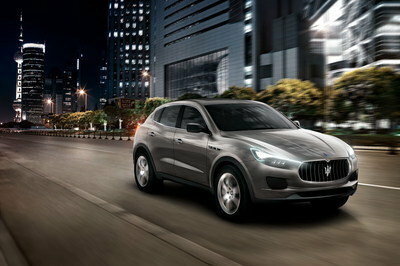 Obviously, this engine is gear more toward the global market where diesel is still a lot more commonly used. 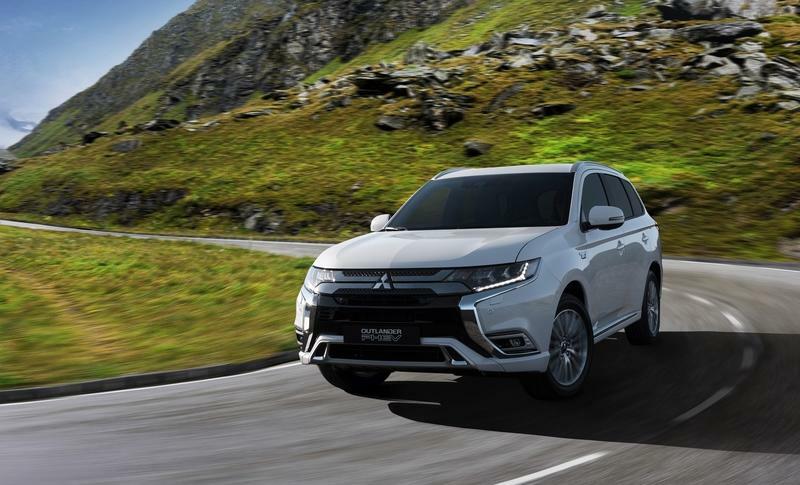 Read our full review on the 2019 Mitsubishi Outlander PHEV. 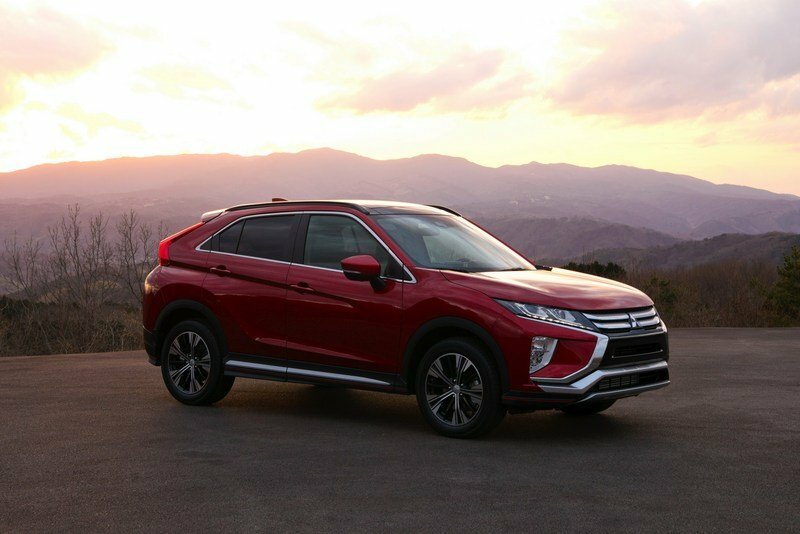 Read our full review on the 2018 Mitsubishi Eclipse Cross.